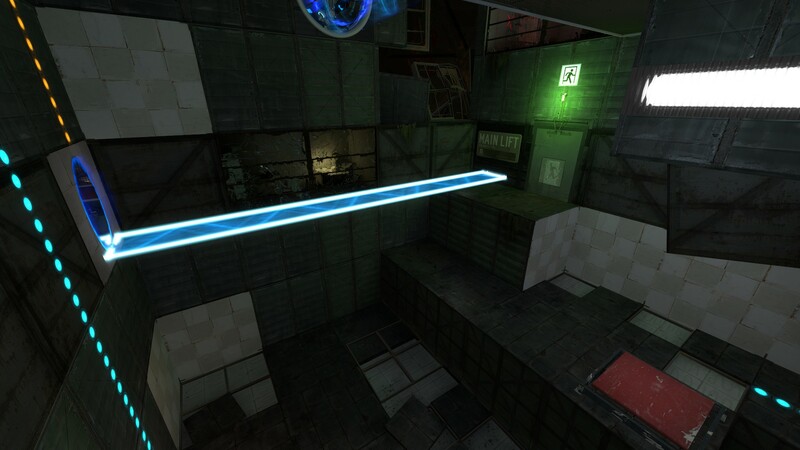 After having fun with the Hammer editor creating my Half-Life 2 map I could not resist making something for Portal 2. I ended up with a puzzle called “Building Bridges” where you have to use physics in unconventional ways to make your way forward. I started out by making a bunch of prototypes. From each one I learned what worked and what I liked and created goals that I wanted my final level to reach. It should be more compact. The goal should be clear and nearby but just out of reach. You should have to use physics to complete the puzzles. Some puzzle devices should be used more than once. 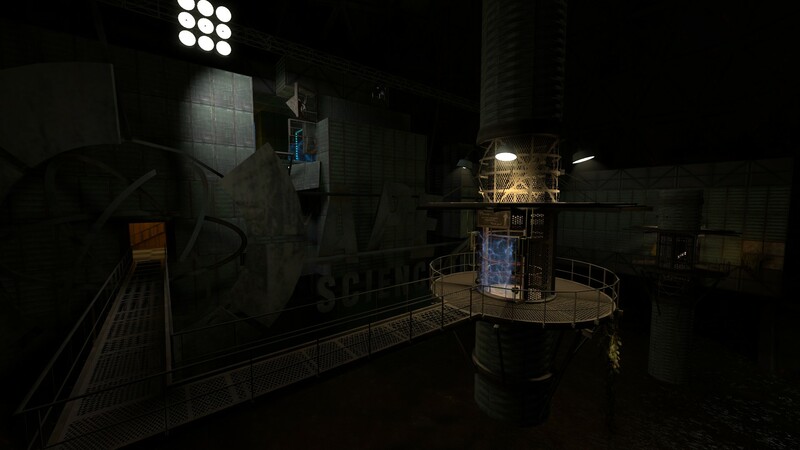 The chamber consisted of two separate puzzles, both with a similar theme: To use physics – gravity to be exact – to solve them. They were quite compact and did not require much running. After the player learns how to use lightbridges to cross the water (area 1) they can solve the first puzzle within the dotted area (area 2). The second puzzle is a little more vertical but uses up every corner of the room (area 3). and then built the puzzles around them when I was satisfied with how people reacted and how they worked. In the first puzzle, getting the cube is not too tricky. It’s even easier getting to the exit. The tricky part is opening the blocking lightbridge. Most testers get the cube and think they are done when placing it on the button, but then the lightbridge switches place and you are still on the wrong side. The player must both stand at the exit and deliver the cube onto the button at the same time. To proceed they will have to leave the cube behind for a second while they continue to the exit and letting go of the lightbridge trusting gravity to to the job. 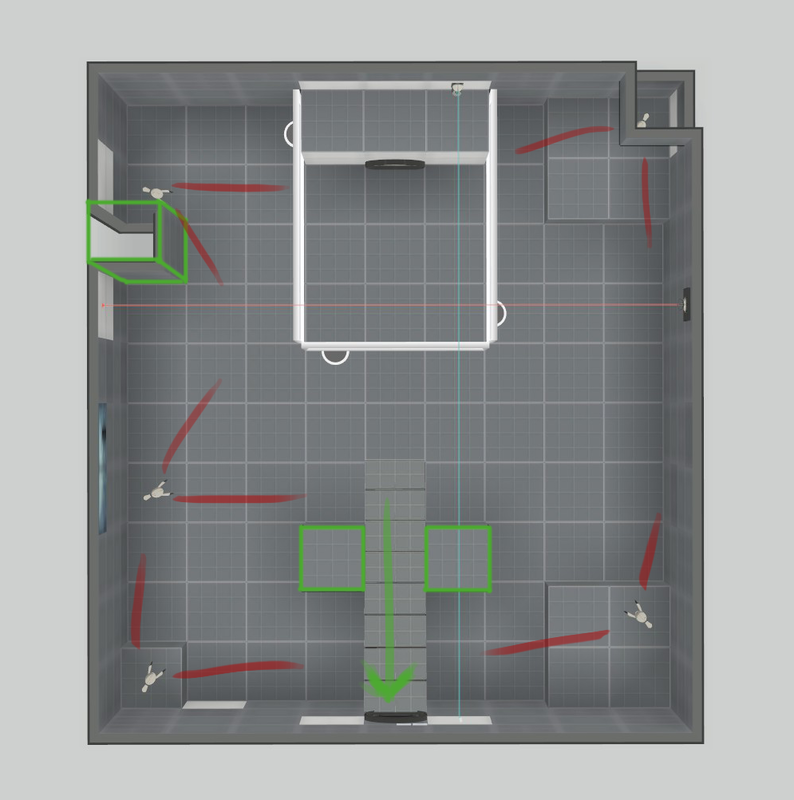 In the second room the ball has to go into a slot on the wall. The problem is that its behind a fizzler. Same as in the first puzzle, the player cannot get it there by picking it up and walking there. The button on the floor deactivates the fizzler. Then with the conveniently broken panel beneath, the player can create a slope out of the lightbridge in the room for the ball to roll down. If the player is standing on the button then the ball will roll through the portal and into the tractor beam which pushes it in place. Just like the first puzzle, gravity will do the work for you. The second room has a tall ceiling, but for a reason. To solve the puzzle you have to move about in all corners of the room. The ball will roll through where the orange portal is in the image and land in the slot. 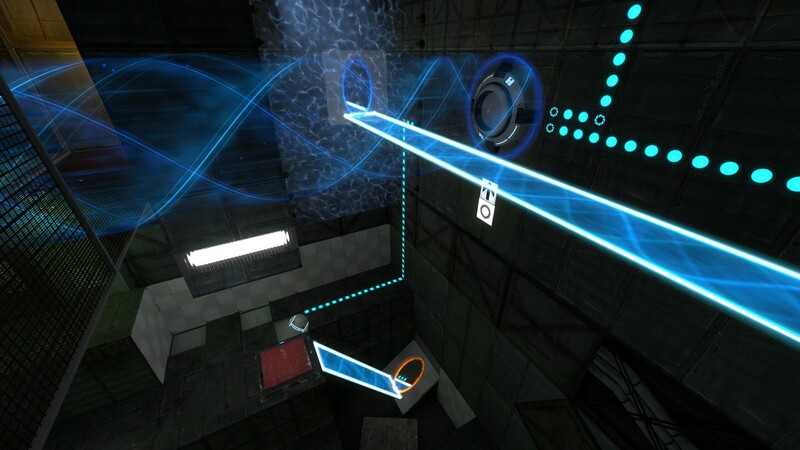 The player will at one point come out of the blue portal and cross the funnel. After that they must instead jump into and follow the funnel over to the lightbridge. From there the player makes their way to the opposite corner and then on towards the exit. Reusing mechanics helps with keeping the level compact. Here, the funnel is first used to hold the sphere in its slot, then it works as an obstacle for the player and then as their way forward. Something I strived for was to have the exit of each puzzle be easy to see but hard to reach. Here’s the exit in the first puzzle. It is easily recognized by the sign and the green light. Its also always nearby since the puzzle area does not extend much farther than whats shown in this image. 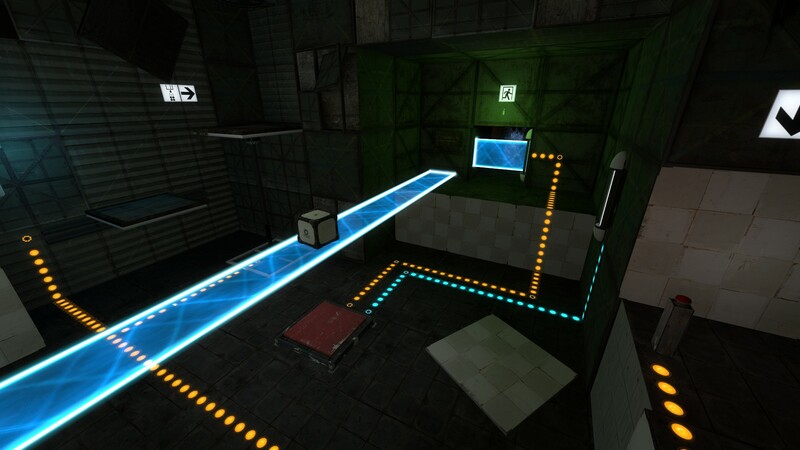 The player comes walking into the puzzle on the lightbridge already showing the player how to get up to the exit, the only thing they need now is to deactivate the blocking lightbridge. But that proves to be the tricky part. The second puzzle does almost the same. When you enter the level you see the exit in front of you. You can even get up on the ledge just below it, but the next step will prove to be kind of tricky. 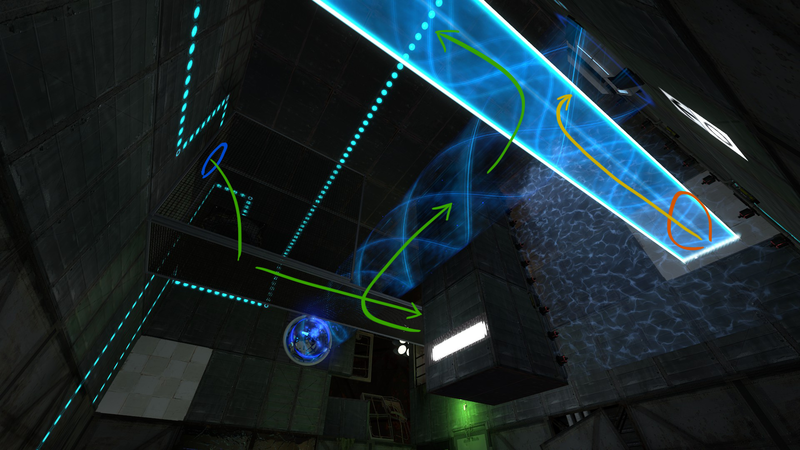 When you have got the sphere in place you will be able to form a lightbridge leading to the exit. Nearly all testers did this which gave them the last step of the puzzle. They could now choose to work backwards from that point or just continue as they were. When playtesting – but also after release – there have been players who’ve found alternate ways to complete puzzles. At first, my instinct told me to block every different route one could take. Quite soon i realized that alternate solutions wasn’t always a bad thing. I treated every new find with a lot of thought. How much of the level can be skipped using the method, did many people find this “incorrect” way of doing it and how hard was it to pull off. Most importantly, I asked the question: Is it less rewarding than the “correct” solution? For example: If a “skip” is hard to find or to perform but bypasses a whole puzzle, then it will probably not be as rewarding and they will not really experience my level. I began the process by making prototypes in the Portal 2 puzzle maker to try and figure out what kind of level I wanted to create. I tried some different gimmicks to see how I could really make the level my own. I made several chambers which I ended up scrapping completely. This one was made from a vision where I combined Portal 2 with Mirrors Edge. You were supposed to hit a button in the beginning which opened the exit and then make it past an obstacle course before it closes again. Running and doing parkour while jumping through portals, sounds fun eh? Turns out running in Portal 2 is rather slow and boring, and there is a lot that can go wrong when jumping through portals which wrecks your momentum. This led me to go for designs that were a little more compact and let you take a more slow approach to solving them. After this prototype I decided I would go for a more compact design where you never had to walk any long distances. Also, the goal of the level was way to far away. This puzzle became a prison break scenario where you started out stuck in a glass cage with turrets guarding you from every direction. The player had to sneak by some and take out some turrets to succeed. They also had to use the vertical lightbridge to guard themselves from turret fire. This puzzle too looked cool in my head but didnt work out like I envisioned it. It was hard to give the player options at the same time as having a set solution for the player to find. Also, if the player misstepped it often resulted in an annoying death. After this test I knew I wanted to use more puzzle mechanics and to let the player solve puzzles in a rather safe environment. So after these and a few more prototypes I decided on the previously mentioned goals for my level. This was my first portal 2 map, but I can safely say that it won’t be my last. I had a blast making it! Something I will do different for my next project is to do much more research before starting. 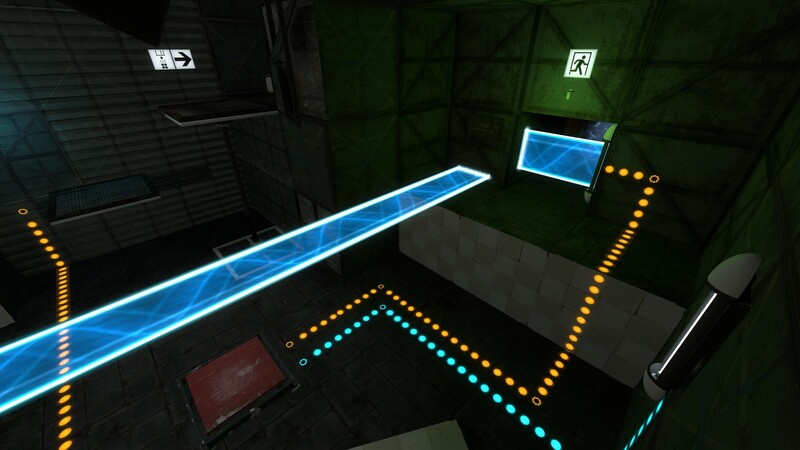 My map is set in the underground theme of portal but uses mechanics and devices that isn’t present there in the main game. This not only detract the believability from a lore perspective, but also takes you out of the underground feel since some devices does not have skins that match the setting. For my next map I will also not export the prototype from the Portal 2 Puzzle maker but instead make it from the ground up in Hammer after I’m done testing the basic layout. This will reduce the blocky feel that maps easily get otherwise since the puzzlemaker only builds by using ~2x2m big blocks. Testing the map was very interesting since most early testers were people nearby in school that did not frequently play the game. The difference between them and the players in the steam community was pretty big. So to make a puzzle that challenges everyone without being to hard for some was a challenge. I think I was pretty near some kind of sweetspot with my level since it adds a new element almost. Experienced players were sometimes so used to their ways that they got caught up on some steps while inexperienced players saw things with new eyes. The level has now been played more than 3,000 times and has 96% positive ratings. Even though there are much to improve upon I’m still proud of my creation!